Between 1990 and 1995, CBS’s popular television program, “Northern Exposure” garnered a variety of awards including the 1992 Primetime Emmy for Outstanding Drama Series. Though filmed in Roslyn, Washington, Talkeetna, Alaska was considered to be the inspiration for the show’s town of Cicely. Talkeetna is located 2-1/2 hours north of Anchorage and about 2-1/2 hours south from the entrance of Denali National Park. We decided to check it out because of its reputation. 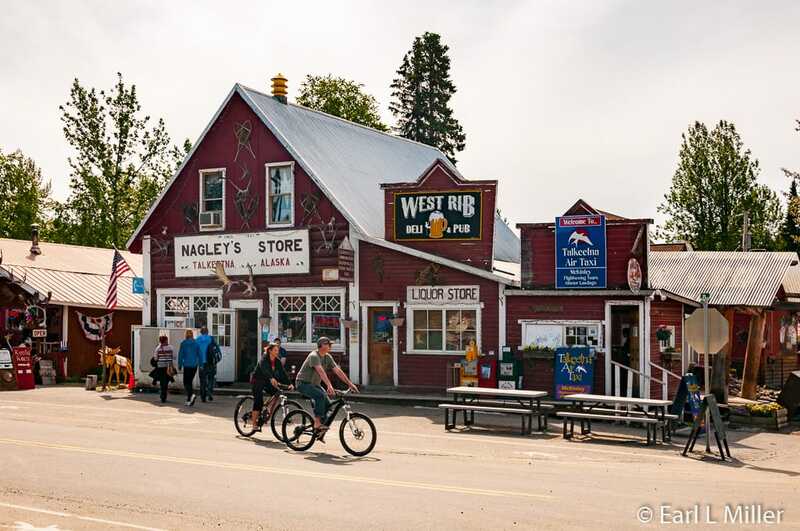 Having gained esteem as an adventure locale, this small town is famous as the base for Denali’s mountaineering expeditions and for flightseeing. It offers such active pursuits as a zipline tour, gold panning, and riding behind a team of huskies. Visitors find 14 miles of paved mountain bike trails, almost 25 miles of hiking trails, and several campgrounds. Anglers try their luck catching one of five salmon species, trout, or dolly varden. Fishing charters are plentiful. Canoeing, rafting trips, jet boat tours, and kayaking experiences await visitors. History buffs can visit a reproduction of the nearby Dena’ina native encampment or explore homesteads once inhabited by Alaska’s pioneers. Rail fans enjoy hopping on the “Hurricane Turn Train,” America’s last flag-stop train (stops on an as needed basis.) It runs 50 miles from Talkeetna north to Hurricane and back. Guidebooks tout it as a great way to see the countryside with locals. The town itself is a throwback to the Wild West. Its downtown district, roughly two by three blocks, is on the National Register of Historic Places. 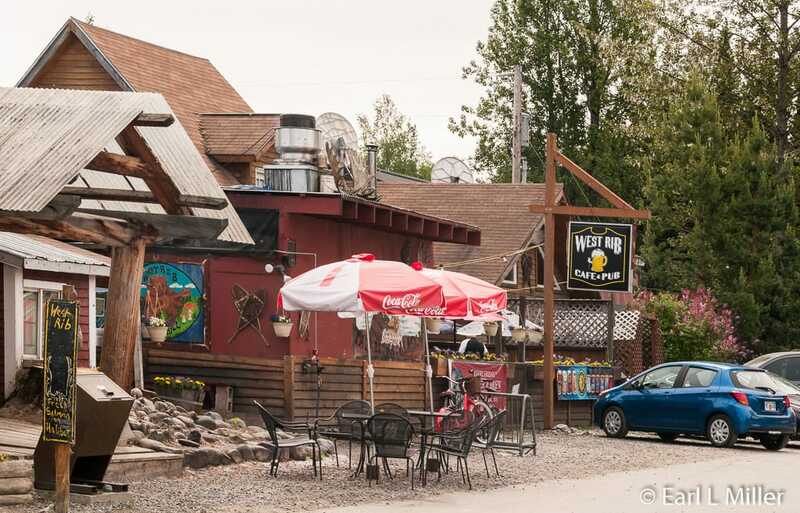 Visitors Immediately notice the unpaved streets surrounding a central green and Talkeetna’s log cabin architecture. Walking around town, visitors browse through unusual shops and several art galleries. Mostly Moose Gifts sells moose themed gifts and apparel. Constructed in the 1930's, it was the home of Ole Dahl, a miner and barber, who lived there with his wife Annie and five children. Old timers recall sitting in the barber chair, getting 50 cent haircuts, and watching Main Street events. Nearby Bears & Beyond Gifts concentrates on bear related items. Running from Memorial Day to Labor Day, visitors check out the town’s Artisan’s Open Air Market held each Saturday through Monday from 10:00 a.m. to 6:00 p.m. They find booths selling jewelry, clothing, and local crafts at the Sheldon Community Arts Hangar behind Nagley’s. At Kahiltna Birch Works, located a mile out of town on Spur Road, the owners, Michael and Dulce East, produce birch syrup and other products. They tap more than 10,000 birch trees each spring to produce 140,000 gallons of sap and 1,300 gallons of syrup. Their company is acclaimed as the world’s largest producer of birch syrup. Several dining choices range from the Flying Squirrel, which is a bakery café, to brew pubs, Thai food, and pizza. Wildflower Cafe’s owner/chef Jerome Longo was previously a chef for President George W. Bush. Wesr Rib Pub and Grill was on Man Versus Food. The restaurant offers "Seward's Folly" which is a huge burger. Lodging options range from resorts such as Princess Cruises’ Mt. McKinley Wilderness Lodge and the Talkeetna Alaskan Lodge to the historic Fairview Inn. The town also provides guesthouses, bed and breakfasts, and cabins. All are in a walk around atmosphere encouraging visitors to explore at their own speed. A copy of the Town and Trail map for a self-guided tour is available at local businesses. For visiting the town’s outer environs, driving an automobile becomes necessary, unless you are on a tour. Don’t want to drive? You can reach Talkeetna on a bus from Anchorage. Another option is to arrive on the Denali Star or Aurora Winter Trains of the Alaska Railroad. These run between Anchorage and Fairbanks with stops at Talkeetna and Denali National Park. After a hectic day of adventures, it’s time to relax. The Village Park holds free summer concerts each Friday at 5:00 p.m. The Fairview Inn has live bands five nights a week during the summer and on Saturdays during the winter. Another option is having a drink at one of the bars while chatting with locals. At first, the Talkeetna area was an important destination for the native Dena’ina population. Thriving on hunting and fishing, they were a semi nomadic group living in groups of 30 or 40. Birch trees were vital to these people. The trees provided lumber for house frames, snowshoes, and utensils, as well as bark for canoes and containers. During the summer, they lived in fish camps, lean-to structures made from spruce logs. Located near water tributaries, the major source of food for these people was salmon. In fact, the name “Talkeetna” means River of Plenty. Susitna Valley’s first gold rush brought prospectors in 1896. However, it took the 1905 gold discovery in the Yentna-Cashe Creek District, just west of Talkeetna, to encourage development. Sternwheeler river boats soon plied their ways up the Susitna River, docked in Talkeetna, and allowed it to become a mining supply town. In 1914, President Woodrow Wilson signed a law enabling the federal government to build a railroad from Seward to Fairbanks. Talkeetna became the district headquarters for its construction with almost 400 people employed by the end of 1916. The town built a sawmill, two roadhouses, a hotel, general store, warehouses, cafes, specialty shops, and many cabins. Population peaked at 1,000 during the railroad’s construction years. The railroad’s townsite map was used to further develop the village. After petitioning for a land sale in 1918, 80 lots were sold in October 1919. Many people bought more than one site. Entrepreneur Horace Nagley, who owned the general store, bought 15 of the 80 lots. The town rapidly declined, with only a few dozen people staying, after the railroad was completed in 1923. 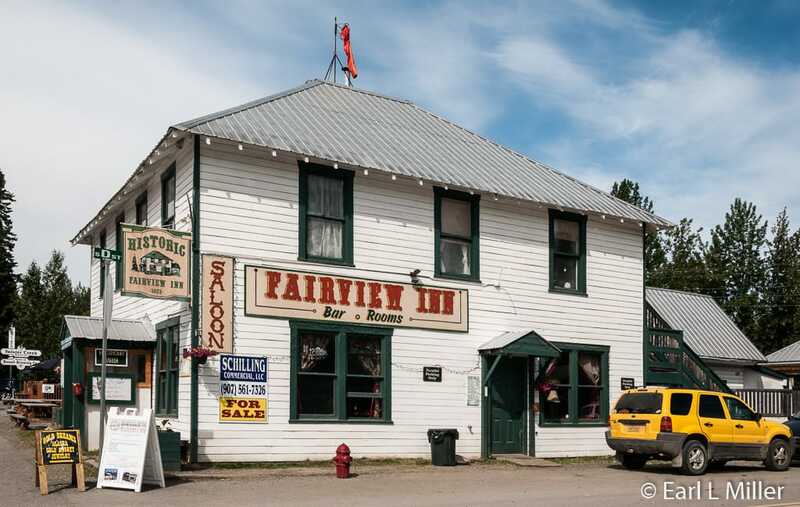 Ben Nauman’s Fairview Inn, constructed that year, became a popular stop for accommodating railroad travelers. It contained the town’s first bathtub. Later that year, President Harding came for lunch. Unfortunately, he fell ill and died a few days later. Today the inn consists of six renovated rooms, a bar, and a live music venue. H. W. Nagley’s store, which opened in 1917 or 1918, moved to its present location at 13650 Main Street in 1945. It is still the town’s general store. Its crowded interior reeks of old-time atmosphere. You can purchase groceries there or go upstairs to check out their outdoor supplies. Furs, traps, snowshoes, and photos line the walls. Adding flavor is Stubbs, the town’s honorary mayor, sometimes asleep in his own cat box. Though the first paid teacher was in 1917, the first schoolhouse did not appear until 1936. Today it serves as one of five of the local history museum’s buildings. The first swarm of tourists arrived in 1963 when astronomers declared the village the best place in the United States to see the total solar eclipse. It’s estimated 2,000 people rode the train for this event from Talkeetna to McKinley Park. In 1964, construction of the Talkeetna Spur Road, connecting Talkeetna to the newly built George Parks Highway, occurred. This made road travel possible for people to reach the town. Another major influx was Alaska’s Open to Entry land sale program in the 1960's and 1970's. People selected land, leased it from the state, then bought it later at fair market value. During the 1990's, cruises and land tours exposed more people to the town’s charm. 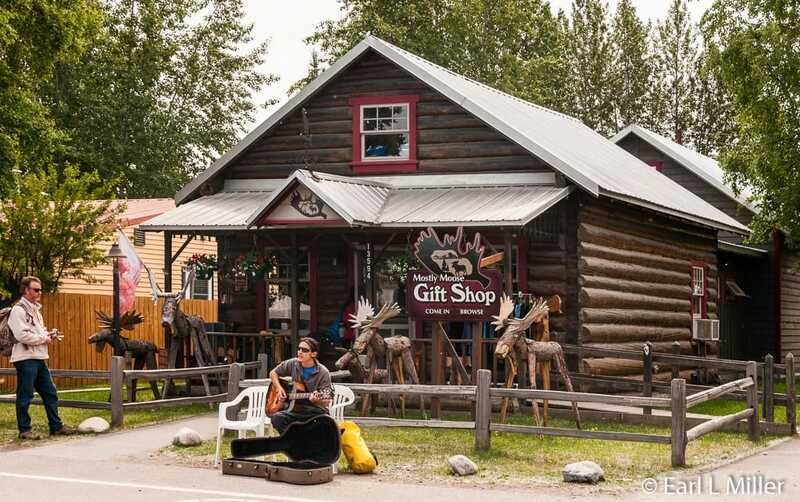 By 2010, Talkeetna’s population listed at 876 residents. The honorary mayor of Talkeetna is Stubbs, the yellow, Manx cat, who is 19 years old. A popular rumor says Stubbs was elected following a successful write-in campaign when the voters opposed the human candidates. However, the position has always been honorary since Talkeetna is an unincorporated village with no real mayor. Stubbs primarily resides at Nagley’s General Store where his favorite food is crab. He enjoys drinking out of Main Street puddles and sipping from his catnip-laced, water filled margarita glass at the bar at the West Rib Deli and Pub, located directly behind the store. When we were there, he must have been meeting elsewhere with constituents since we didn’t spot him. He has survived a few incidents. He fell into a vat of cold fry oil, hitched a ride on the garbage truck, and was shot at by teens with BB guns. On August 31, 2013, he survived an assassination attempt by a dog which resulted in a punctured lung, fractured sternum, and deep side wound. Due to excellent veterinary care, he recovered. Pioneer flying in Alaska took off after World War II ended. Two area leaders were Glen Hudson and Don Sheldon. Hudson arrived in 1947 with a two-place Aeronca Chief airplane. He soon discovered locals and visitors would pay for him to transport them to superior hunting and fishing spots. Don Sheldon returned to this community in 1948 with a Piper PA-14. Because of these two men, the demand for charter flights across the region blossomed. In 1948, two air services arrived. Sheldon partnered with Robert “Stub” Morrison to form Talkeetna Air Service. At the same time, Hudson’s younger brother, Cliff, arrived and started Hudson Air Service. This enabled fishermen, hunters, trappers, prospectors, miners, and freight to leave and enter Talkeetna. The type of aircraft used depended on the season and destination. Aircraft used everything from wheels to floats and fixed skis which allowed landing on snow. During the early 1950's, the air services became engaged in controlling large packs of wolves which roamed the area. The bounty was $50 per wolf. Usually rifles were fired out the side door. However, Sheldon, a former tail gunner during World War II, rigged semiautomatic shotguns to his Piper aircraft’s wings. At the historical museum, you can see photographs, wolf pelts, and the actual guns he used. During the mid 1950's, flying became more sophisticated with retractable landing skis. These are still used today and are particularly handy during glacier landings. During this period, Dr. Brad Washburn, of the Boston Museum of Science, mapped Denali and the Alaska Range. This added revenue to the air services and established the best approaches and climbing routes on Denali and neighboring peaks. The practices, tactics, and methods developed for flightseeing, glacier landings, and mountaineering are used today. The desire for mountaineering grew in the 1960's. Until 1966, around 300 had attempted climbing Alaska Range mountain peaks including Denali. During the late 1960's, these adventure seekers came from around the world. By the end of the 1970's, the number of attempted climbs each year was more than 500, and since 2010, they have increased annually to between 1,100 and 1,250. During the 1970's, three new air services developed due to the demand for mountaineering. 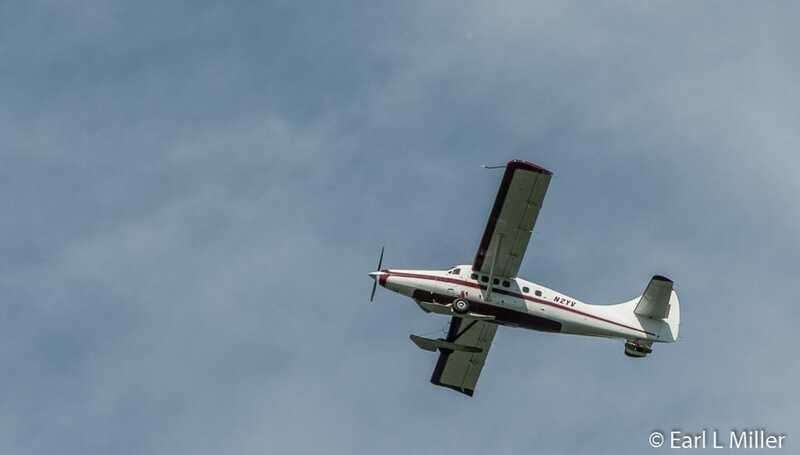 Talkeetna Air Service, after Sheldon’s death, transferred to a third party. In 2009, Sheldon Air Service purchased the historic Hudson Air Service. Numerous other air services now provide pilots. Flightseeing without landing on glaciers has definitely become established. Flights are obtained at Talkeetna Airport with K2 Aviation and Talkeetna Air Taxi being the largest operators. Sheldon Air Service is regarded as an excellent family operation offering a personal touch. Visitors can purchase a variety of flightseeing options. Some are short scenic flights. Others land on the mountain or the 7,200 foot level of the Kahiltna Glacier. Extended flightseeing circles the mountain and flies over glaciers. Rates depend upon the operator, type of airplane, flight length, and how many people are in your group. It’s wise to reserve a couple of days in advance and go in the morning before the daily cloud buildup. Weather is always a consideration. 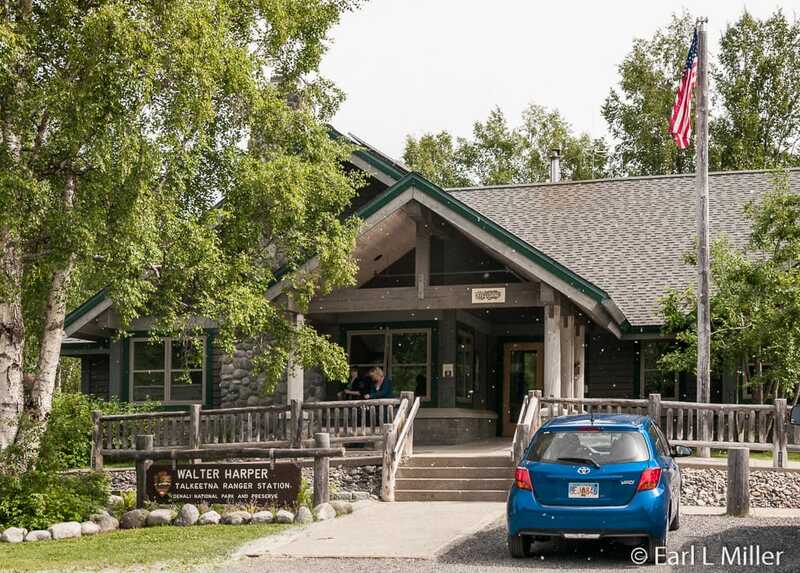 For insight into Denali mountaineering, head to the Walter Harper Talkeetna Ranger Station located on B Street. It’s the support center for Denali National Park and Preserves mountaineering operations. The station is named for Harper, the first native Athabascan mountaineer to set foot on Denali’s summit. Before Hudson Stuck successfully led an expedition, including Harper, to Denali’s summit on June 7, 1913, eight other groups had tried to climb the mountain. Each year, between late April and early July, more than 1,000 climbers attempt to reach the summit. 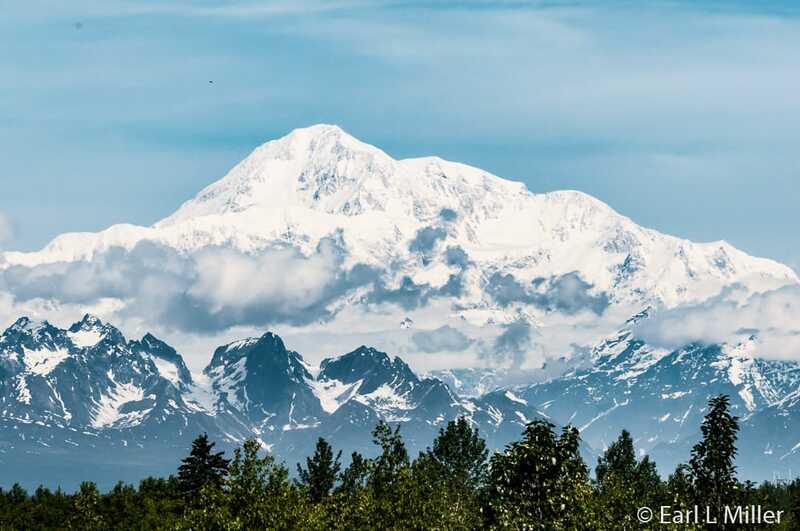 Anyone attempting Denali (20,310 feet) or Mount Foraker (17,400 feet) must stop by the ranger station for an orientation with a national park ranger and to obtain their climbing permit. Information is also provided at this location for those headed to the other Alaska Range peaks. Registration must occur 60 days in advance of their climb with climbers paying a $365 fee for climbing Mt. Denali or Mt. Foraker. To do this, they need to write to the Talkeetna Ranger Station at P.O. Box 588, Talkeetna, Alaska 99676 or telephone (907) 733-2231. In a typical year, only one-half of the climbers succeed. More than 123, as of 2015, have lost their lives at this effort. It usually takes an expedition 17 to 21 days. Failure occurs for numerous reasons - extreme winds, cold temperatures, equipment failure, fatigue, injuries, and altitude-related illness. A visit to this station provides an opportunity to gather park information, visit the bookstore, and see a video upon demand. A highlighted exhibit consists of photos taken by Bradford Washburn during his Alaska Range mapping. During the summer, the station provides interpretative programs about climbing Denali. The 17 minute video, “Mount McKinley - Climbing North America’s Icey Crown,” gives good insight into the arduous effort needed to ascend to the summit. Climbers must be fit, well prepared, and self sufficient. Experienced climbers do die on the mountain. The mountain draws international climbers, men and women, from all age groups. Eighty- five percent attempt it from the west buttress. They fly in and start at a base camp of 7,800 feet. They average 40 pounds in their pack and 60 pounds on their sled. They back down each day to this level after ferrying supplies to their next point on the mountain. The key is to climb high and camp low. Camp two is at 8,000 feet. Upper Kahiltna Glacier is the third base and is located at 11,200 feet. Here mountaineers switch from skis to cramp-ons. They set up camp including melting snow for cooking and eat twice the normal amount to sustain energy. At 14,200 feet, the park service has set up a small camp at this level. Climbers take time here to acclimate before setting out for the most difficult part of the climb. They then make camp at 17,200 feet before trying to reach the summit in one day. The climb back down is the most dangerous since they need to place each foot carefully. It’s possible to descend in two days to base camp. Jeff Pfeiffer, the national park ranger on duty at the station, explained what climbers pack in, they must pack out. He said Mt. Denali has the cleanest mountain system in the world. All climbers and back country campers must carry a Clean Mountain Can for human waste. Their ranger, Roger Robinson, designed the can. This ranger station is open year round. Its hours are mid-April to Labor Day from 8:00 a.m. to 5:30 p.m. daily. It’s open Monday to Friday, 8:00 a.m. to 4:30 p.m., during the rest of the year. 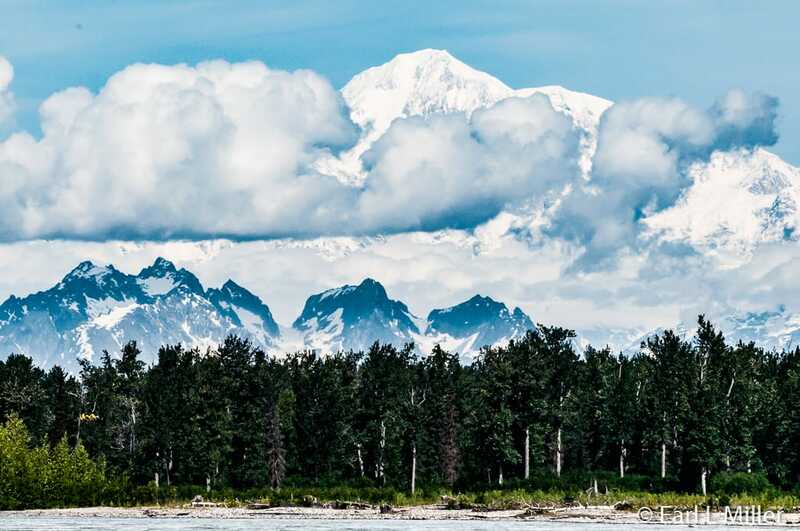 One historical dispute was whether to call the mountain and park Denali or McKinley. Although the native Athabascans have always referred to “The Great One” as Denali, such has not always been its name. It was referred to as Mt. McKinley in 1896 by a gold prospector in support of then presidential candidate William McKinley. President Wilson recognized that name when he signed the Mount McKinley National Park Act of February 26, 1917. However, in 1975, the State of Alaska’s Board of Geographic Names changed it officially back to Denali. Ohio congressional delegations resisted the park’s name change honoring President McKinley since he had born in their state. They blocked it multiple times on the federal level. The final change was undertaken by Obama’s Secretary of the Interior, Sally Jewell. On August 30, 2015, she issued a Secretarial Order officially changing the name to Denali ahead of Obama’s visit there. Our first stop was the roadside viewing area where we saw an outstanding view of Mount Denali, the Alaska Range, and the Susitna River Valley. It’s a mile south of town across from the Talkeetna Alaskan Lodge at Mile 13 of Talkeetna Spur Road. The beach where the three rivers (Chulitna, Susitna, and Talkeetna) meet is another option. Most Alaska visitors aren’t aware that Denali is viewed on a clear day only one third of the time. Since it is so tall, it makes its own weather that often covers it in clouds. Housed in the old territorial school, the Talkeetna Historical Society Museum concentrates on the town’s heritage as told through photographs, newspaper clippings, and antiques. Exhibits introduce visitors to native peoples, aviators, gold seekers, and trappers. Two other buildings are historical railroad buildings, circa 1920s, relocated to the museum site. One was the railroad depot and the other was the railroad section house. They house a transportation exhibit and a mountaineering room with a three dimensional exhibit of the Alaska Range. This display is owned by the National Park Service. During the summer months, mountaineering talks are given daily at 1:00 p.m.
Two other buildings are involved as well. The Old Dahl Cabin, built in 1916 by trapper and miner, Ole Dahl as his home base, is the oldest existing structure in Talkeetna. It has been moved to the museum. Unfortunately, since it was under reconstruction, Earl couldn’t get a shot of it. Belle’s Barn Historic Site was the location of Belle Grindrold McDonald’s horse barn. It was used in her horse freighting/supply business. The barn is located close to the Susitna River banks. From the beginning of May until the third week in September, hours for the museum are daily from 10:00 a.m.. to 6:00 p.m.During the rest of the year, it’s open on Saturdays and Sundays from 11:00 a.m. to 4:00 p.m. It’s located one block off of Main Street across from the Sheldon Community Arts Hanger. The telephone number is (907) 733-2487. Parking is $3 and admission is free. This two-story log structure, built between 1914 and 1917, was constructed by Frank Lee to supply area miners transporting goods by horse drawn wagons. 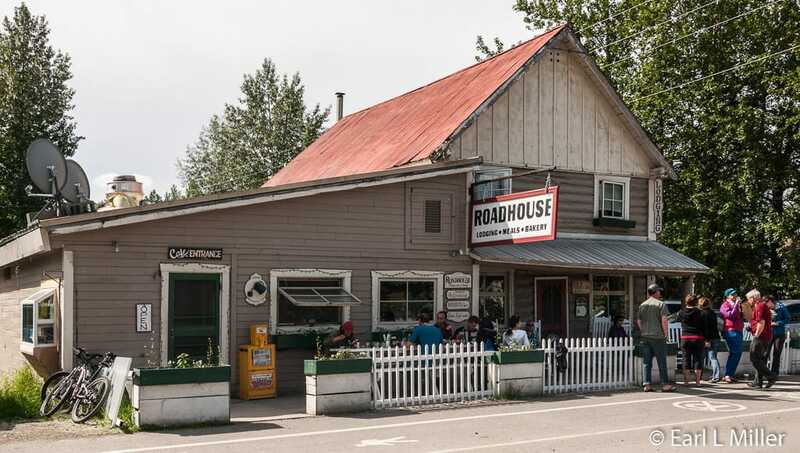 Since 1944, the property has been a roadhouse where owners have rented rooms and provided restaurant service. Decor is basic and the atmosphere is casual. Seating is family style at long tables encouraging conversations with others. A chalkboard menu lists two options: “Breakfast” available until 2:00 p.m., and “Not Breakfast.” Breakfast items include giant cinnamon rolls, chocolate potato cake, and gargantuan sourdough hotcakes from a starter that has been around since 1902. This restaurant is renowned for its desserts including berry pies, homemade reindeer chili and pasties, and hearty soups. It offers quiches, squarebun BBQ pulled pork sandwiches, lasagna, mac and cheese, and salads. During the afternoon, home-baked bread is available from their bakery section. Prices are reasonable ranging from $6 to $12.65. It’s located at 13550 E. Main Street and the telephone number is (907) 733-1351.